A beautiful wooden nativity set, great for children to play with and as a Christmas decoration that can be enjoyed for many years. When I was a child, one of my favorite activities was decorating the house for Christmas and I look forward to continuing the tradition with my daughter with items like this Melissa & Doug Nativity Set. If you’re looking to buy this nativity set, you can get it at 25% off with opportunity for free shipping at the link below, or read on to find out why I like it so much. Buy the Melissa and Doug Nativity Set at Amazon now. We always had a nativity set as part of our home Christmas decorations when I was growing up, even though we were not a particularly religious family. We would set it up in the small window next to the front door so it was visible from the outside, put lights around the window frame, hang a start in the window and surround the scene with cotton wool ‘snow’. The nativity set we had, I believe my mother had made from a craft kit as it consisted of soft stuffed pieces which we kids loved playing with. I think a nativity set is a great play opportunity as well as making appropriate Christmas decoration, which is why I like this Melissa and Doug Nativity Set so much. The Melissa & Doug Nativity scene is made from wood and comes with 11 figures and a 4-piece stable. It also includes a Christmas story on the package which kids will love. I think this will make a really nice Christmas activity for kids, setting up the nativity set together and reading the story. The chunky wooden figures are great for little hands to hold and you don’t need to worry about them being broken by curious children. My little girl is fascinated by any kind of nativity scene we have seen when out shopping so I really didn’t want to buy one for our home that would be out of bounds for her to play with. I’m a big fan of Melissa and Doug toys – I love that they’re made from wood, not plastic but they’re also affordable. They also seem to really understand children and what they enjoy playing with and I think toys like this are great for encouraging creative play and much more fun for small children than an electronic game or generic plastic toy. 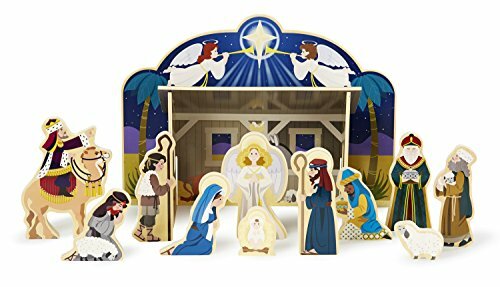 For the best price on this Melissa & Doug Nativity set, use the Amazon link below to get 25% off retail price and a FREE shipping option.